The recipe for Buttery leeks appears in the Cook’s Companion App and book, and the meltingly soft leeks work beautifully in a tart. Preheat oven to 200°C. Line a 20cm flan tin with pastry and bake blind for 20 minutes. Reduce oven temperature to 180°C . Wash and drain leek, then dry well by rolling in a clean cloth. 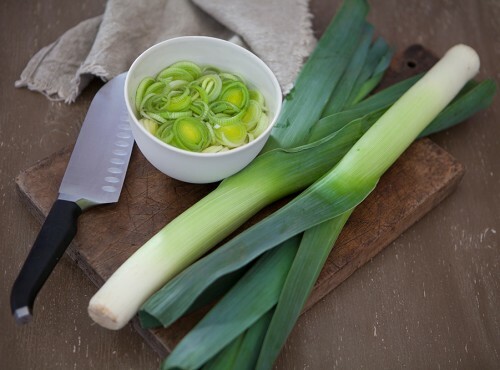 Melt butter over a medium heat in a frying pan and add leek in a layer no more than 6 cm deep. Cover pan and cook leek for 10–12 minutes until nearly tender. Remove lid, increase heat and stir while excess liquid evaporates. When leek looks soft and there is nothing slopping around in the pan, season with salt, pepper and nutmeg. Combine eggs, egg yolks and cream, then stir through leeks, pour into pastry case and bake for 20 minutes. Variation Crumble some fresh goat’s cheese into the mixture to make a leek and goat’s cheese tart.